Thinking back, I was a right pain each time Wendy got near the end of every one of her pregnancies. I’m not the most patient of people and the thing is it’s that time once again as we reach towards the end of a number of pregnancies around the farm and it’s driving me bananas. Firstly our two pygmy goats seriously look like they’re going to explode and they should be due any day now, but as much as I’d like to, this impatient little soul can’t choose either the day or the time that their kids are born. Alongside the goats of course we have Lyndsey and Flora, two of the Highland cows which we’re hoping are pregnant. I say hoping, because we don’t have them scanned to check and we don’t have the vet in with his extra long marigold to check either – we just let nature take it’s course. For the last two years, around this time, I have spent far too long leaning against that fence, just staring, wondering, are they or aren’t they? On both occasions, we’ve ended up with no calves. This year, things are different. They definitely look like they’re growing. Other heifers who were at the same party, with the same bull, have either had calves or are pregnant, so all the signs are good. I will just need to get the two of them into the race and have a rummage to see if they are starting to ‘bag up’, which is when their udder starts to more fully develop, ahead of giving birth. Alternatively, I need to appreciate just how lucky I am to be in this position in the first place, shut up moaning and wait! With the warmer weather we’ve been having, it was time to get the sheep sheared. I once again arranged for Mark and Jenny to come over and get the job sorted and they duly arrive… but early! I had been busy washing up in the Teashop Kitchen and had not noticed that I had received calls and texts from Mark saying that they would be arriving ahead of time. I grabbed a bucket of feed and escorted the sheep through from where they were until we reached the field, where I had made a shearing pen in the corner. I had been saving this field specially to house the sheep after they had all been sheared and so the grass was wonderful, just what they were after. In fact they were so interested in this grass that they weren’t much interested in the bucket of feed, it was all that new grub they were after. Anyway, 25 minutes later and with Mark and Jenny’s help, the ewes were all in the shearing pen and we were ready for action. 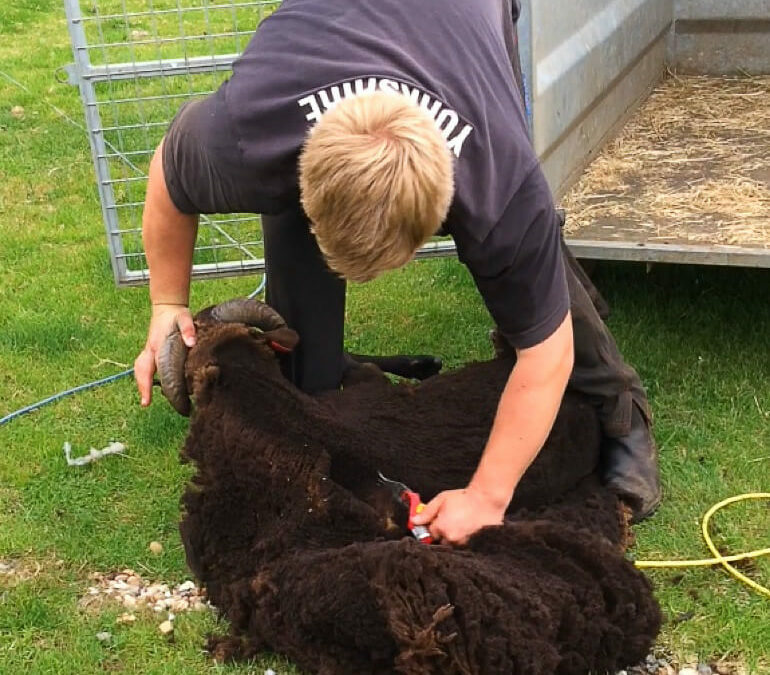 Soon enough the fleeces were coming off and before they went back into the field, I would check each of their feet to ensure that were still in good nick and trim them up as required. It wasn’t long until they were all sheared and back into the pasture and they were loving life, but that didn’t last long at all. It soon started to rain. I’m not sure about other sheep, but mine don’t mind any sort of weather… except rain and without their woolly coats on it was fast becoming a nightmare. They all just stood there moaning with their sad faces on until I moved them back into the field with the shelter and only then did my peace and quiet return.